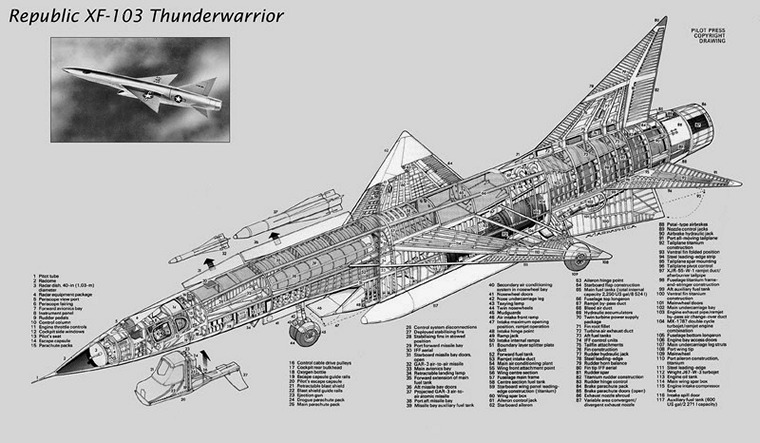 In 1949, the USAF issued a request for an advanced supersonic interceptor to equip the Air Defence Command. Known formally as Weapon System WS-201A, but better known informally as the 1954 interceptor, it called for a supersonic aircraft with all-weather capability, intercept radar, and air-to-air missile armament. Republic was one of six companies to submit proposals. On 2 July 1951, three of the designs were selected for further development, Convair's scaled-up XF-92 that evolved into the F-102, a Lockheed design that led to the F-104, and Republic's AP-57. AP-57 was an advanced concept to be built almost entirely of titanium and capable of Mach 3 at altitudes of at least 60,000 feet (18 km). Mach 3 performance in the 1950s was difficult to achieve. However, experimental ramjet aircraft of the era, like the Lockheed X-7, were reaching speeds as high as Mach 4. There are, however, numerous problems with the ramjet engine. Ramjets rely on forward speed to compress the incoming air, and only become efficient above Mach 1. Alexander Kartveli, Republic's Chief Designer, devised a solution to these problems. He proposed using a turbojet supplemented by a ramjet behind it. Connecting the two would be a series of movable ducts that could route air between the engines. At low speeds the aircraft would be powered by the turboprop, with the ramjet acting as a traditional afterburner. At high speeds, starting above Mach 2.2, the jet engine would be shut down and the airflow from the intake would be routed around the jet engine and directly into the Ramjet. 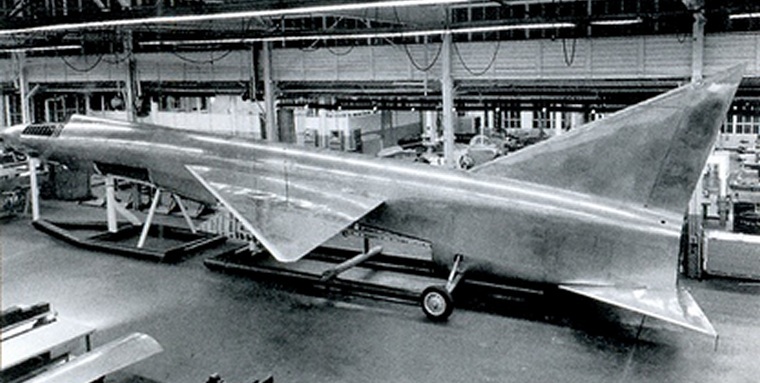 A full-scale mock-up of the AP-57 was built and inspected in March 1953. A contract for three prototypes followed in June 1954. Work on the prototypes was delayed by continued problems with the titanium construction, and more by continuing problems with the proposed Wright J67, the chosen jet turbine engine. The contract was later reduced to a single prototype. The project was eventually cancelled on 21 August 1957 with no flying prototypes ever being completed. The XF 103 was given a brief reprieve as part of the Long-Range Interceptor - Experimental (LRI-X) project that ultimately led to the North American XF-108 Rapier. Part of this project was the development of the advanced Hughes AN/ASG-18 pulse-doppler radar and the GAR-9 missile. Republic proposed adapting the F-103 as a test bed for these systems, although it wouldn't be able to come close to meeting the range requirements of LRI-X. A unique supersonic escape capsule was designed for the XF-103. The pilot's seat was located in a shell with a large movable shield in front that was normally slid down into the area in front of the pilot's legs. In the case of depressurization, the shield would slide up in front of the pilot, sealing the seat into a pressurized pod. To enter and exit the aircraft, the ejection module was lowered on rails out of the bottom of the aircraft, allowing the pilot to simply walk into the seat, sit down, and raise the module into the aircraft. The capsule was fully pressurized, allowing the pilot to continue operating the aircraft without a pressure suit when the capsule was locked up. The entire nose of the aircraft was taken up by the large Hughes radar set. Guidance and fire control were to be provided by the same MX-1179 package being developed for all of the WS-201 designs. Weapons were to be carried carried in bays located on the sides of the fuselage behind the cockpit, which opened by flipping upward, thereby rotating the missiles out of their bays. It was also to be to be armed with six GAR-1/GAR-3 Falcon, with a likely arrangement of three or four each GAR-1s and GAR-3s, fired in pairs. The XF-103 also was to feature 36 2.75-inch "Mighty Mouse" FFARs. Some work was carried out adapting the mock-up to house the 40 inch antenna, which required the nose section to be scaled up considerably. However, nothing ever came of the proposal and the XF-103 development was abandoned.